Proposal: Institutionalizing a global network of “Climate Adaption and Resilience Centers"
How do we "Bridge the Gap" between distant Global Climate Change issues and the personal, everyday lives of individuals? How do we build greater public support for personal and political Climate Action? Place Matters: As important as schools, fire stations, and libraries, - new physical institutions, dedicated to addressing Climate Change issues - are key. 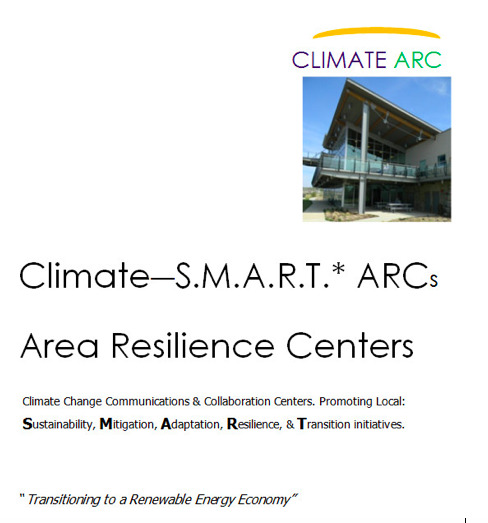 ARC Centers (for Climate Adaptation and Resilience Centers/ARCs) are the solution. The creation of ARCs across the US and around the world holds the promise of mitigating billions of dollars of climate impacts, and reducing human suffering on a global scale. Our CoLab Goal: We propose to launch an Architectural College Design Competition to generate prototypes of 100’s of ARC facilities, and spread the ARCs concept globally. By example, the “Solar Decathlon” * has grown to become a model for such a competition around the issue of Solar Energy, with DOE sponsorship and $2 Million in annual prizes. A New “Class” of Institution: ARC Resilience Centers will serve a vital role in the fabric of society, equal or more important than hospitals, schools, fire stations and other “classes” of institutions. A Destination for Public Engagement, Education and Tourism: ARC Centers will leverage powerful digital visualization technologies (such as virtual reality/ VR) to dynamically attract, engage, and inform the public. VR can make climate change REAL, TANGIBLE, AND PERSONAL for millions of visitors. A Collaboration Center: ARC's will serve as central meeting places for multi-stakeholder and cross-jurisdictional organizations to collaborate more effectively, utilizing these VR and other visual communication tools. A “Showcase” for Connecting Stakeholders & Resources: ARCs will showcase local area organizations, events, and initiatives, to help build powerful networks at a local level. They will inspire a public call to action, and immediately connect individuals and groups with resources and actionable pathways to achieving success. Initiating development and construction of the first in a series of a new type of physical "Institution" to be built across the U.S. (and the world). These "ARCs" will empower communities to take effective local climate action, and to share and collaborate towards achieving global results. The "seed" for this development will be implemented by establishing a national competition for the design of "prototype" facilities, - among Graduate Colleges of Architecture across the U.S. The Core Problem: How do we "Bridge the Gap" between far-removed Climate Change issues, - and our personal lives? Imagine taking your family to visit Arctic glaciers, dive the Great Barrier Reef, or soar into outer space to see the planet Earth from above – all on a single Friday night! Virtual Reality (and other digital technologies) can attract millions of visitors to “ARC Centers” by making the “Experience” of understanding climate issues fun, visceral, and engaging! The welfare of the planet must become related to our personal welfare. When we can shift our personal experience in such powerful ways we can change our understanding, our empathy, and our desire to act. Society essentially has the solutions and technologies that we need to address our existential climate change crises. What is needed is a dynamic new paradigm for communicating and collaborating among multiple interests to implement those solutions toward the greater good of the "whole". ARC Centers will be specifically designed and dedicated to foster such multi-stakeholder and cross-regional collaboration by making complex issues more understandable and tangible through the use of digital visualization technologies. More holistic, systemic solutions can emerge out of having better tools for communication. Groups ranging from local non-profits, to regional governments, corporations to professional conferences now have a dedicated “place” available to interact, - equipped with the latest visualization, tactile and other communications technologies. Hundreds of projects, initiatives and events can also be "showcased" to the public and other stakeholders, to help direct effective local and global climate action. The public will be connected to local businesses, services, and products, to more quickly implement sustainable solutions and services. NGO's and Non-Profits will now have a "Place" to hold fundraisers, that with powerful, dedicated digital imagery,- can educate and inspire their donors. First Steps: A COLLEGE STUDENT DESIGN COMPETITION: The substance of this proposal is to initially foster a national conversation about development of such Resilience Center Facilities. This can be accomplished by holding a design competition among the hundreds of colleges and universities across the country having programs in Urban Planning, Architecture, Environmental Sciences, Behavior Sciences, Business, et. al. Precedent for such competitions can be found, by example, with the "SOLAR DECATHLON"* which has grown to international acclaim, hosted by the DOE with $$ millions in prize monies. While competing for prizes, Regional college teams will develop designs that reflect their vision of what ARC facilities would look like in their region. The local knowledge of student competition teams can help inform what local issues, program materials and technologies would engage users in their regions. Affiliation with college business schools would help develop business and financial plans for operations and economic viability. An analysis of long term and regional ROI/ return on investment can be developed, with regards to mitigation of climate related consequences, as a consequence of the ARC’s more effective communication and collaboration process. The "Solar Decathlon", has grown from a small local college competition to a Global Event. Sponsored by the DOE with $2 Million in prizes, the 2017 Competition will be held in Denver, Colorado. THE VISION: 1,000's of regionally-reflective and locally designed Climate Adaptation and Resilience Centers around the Globe, sharing and collaborating on solutions. PLACE MATTERS Just Imagine cities without hospitals, fire stations, or schools. Unthinkable. Years from now, it will be just as unimaginable that we would function without “Resilience Centers”, such as the proposed “Climate ARCs”. Such Resilience Centers (scaled-out to regions across the country), will touch the lives of uncounted individuals and thousands of organizations. They hold the promise of helping protect millions of US citizens, - and mitigate billions of dollars in environmental and economic damages. ARC Resilience Centers are destined to become a new “Class” of Civic Center, dedicated to fostering more effective collaboration among various organizations. They will help coordinate efforts for implementing solutions to climate-change’s “Three RRRs”; regional Resilience Planning, Response, and Recovery. ARCs will be specifically designed and “tasked” to serve this purpose, as well as to educate and engage the broader population. ARC centers will lean heavily on "State of the Art" visualization and digital display technologies to create a robust, engaging, and profound experience for users. This proposal includes the formation of an ongoing, non-profit, community benefit organization to provide oversight of the Design Competition process, and follow-up activities. For purposes of this current MIT CoLab Contest, the goal is NOT to develop the ARC “facility” itself, per se, but to create a Vision and “Strategic Implementation Plan” for the creation of the country’s first network of ARCs being built across the U.S. The "College Contest" initiative will be led by professional architects, planners, financiers, & educators, and will encourage the participation of ALL of the nation’s climate change stakeholders in the design process. Along with a “Financial, Funding and Operations Plan”, and compelling conceptual architectural renderings, this “Planning Narrative” will serve as a first step for the raising of funds and sponsorship for establishing an actual ARC facility at one or more locations in the U.S.
CONNECTIVITY: ARCs - a Meeting Place for Stakeholders: Too often, meetings are held in “found” spaces, and are ill-equipped with the digital technologies necessary to communicate complex climate issues. The ClimateARCs will provide quality meeting spaces for organizations, civic groups, and other entities, equipped with visualization technologies for effective meetings. AWARENESS: ARCs - A Showcase of Projects, Initiatives, and Resources: "Knowing about local organizations and stakeholders is not enough, we must understand how what they do relates to other organizations”, Digital technologies will present a vibrant and engaging "SHOWCASE" of local projects and initiatives. Users can select topics of interest, to see videos, presentations and other displays. ARCs will be a living "Repository" of local area stakeholder initiatives to foster greater inter-agency awareness. COLLABORATION: A Collaboration Center for Climate Professionals: - utilized for Regional Resilience planning, disaster Response, and disaster Recovery. Conferences, planning, professional education. AN EVENTS CENTER: Hosting On-Site Events, Co-ordinating Others: ARCs can be utilized for ongoing public education, fundraising, and philanthropic engagement. They can serve as a Hub for Marketing and coordinating member events outside the center. BROAD PUBLIC PARTICIPATION: Beyond “100's of organizations and 1,000's of climate professional", the country needs Millions, if not tens of Millions of informed citizens to effect behavioral change. Public engagement and education is critical to policy support and implementation. This is an intrinsic purpose of Climate ARCs. CLIMATE EDUCATION FOR BEHAVIOR CHANGE: Social Learning: how does society and its institutions LEARN? How do we effectively change behaviors in a way that matters? ARCs will provide an immersive, powerful and engaging experience to users*. DESTINATION ATTRACTION: For Tourism, Families, and the General Public. ARC displays will serve to attract, engage, and entertain the public with immersive, even “fun” interactive user experiences that will draw visitors to each center. Programs can extend well beyond "Climate-Change" issues, to other Eco-System and Eco-Tourism related materials, to help broaden exposure, and build a sound revenue source. The Impact of this proposal, upon full implementation, is expected to be significant, - and global in reach. It should be straightforward to quantifying such results as the number of college competition team entries, their geographic distribution, and creative new ideas submitted. We can tabulate sponsorship dollars and prize awards, mentorships and other metrics of the competition. With regards to actual ARC Centers, we can measure the roll-out and construction of actual facilities and locations, as well as their number of visitors, meetings and events held, funds raised, initiatives and ventures started at each facility, etc. We will also be able to quantify the scope of program materials, resources, and entities involved and “showcased” throughout the “Climate ARC” national network and eco-system. The exact impact of promoting and changing public perceptions and behaviors as a result of all these activities, may be more difficult to quantify but holds the potential, literally, to save countless lives, and billions of dollars in climate change impacts. ARC Centers are expected to be a significant benefit to human society and ecological systems across the Earth. A “seed” group of stakeholders in Boulder, CO will network (through personal, social media and other strategies) to grow to sufficient critical mass to serve the project’s initial launch. The CU Grad. School of Architecture and Planning is anticipated to play a key role, and former Dean, Tom Clark, as well as various professors there have expressed support. A number of potential co-sponsoring organizations, businesses, and Climate Research Labs have been contacted and have also expressed interest in participation. (for a more complete list see the tab: “Reference Tab. /Stakeholders”). As the ARC leadership group evolves, it is anticipated that it will form an Advisory Committee, Board of Directors, and Mentors list to create a broad nation-wide presence. With the growth of the ARC College Design Competition, each participating “Team” is anticipated to reach out to local resources in their region to continuously expand the larger network of affiliations and supporters. Stakeholders will include: Educational, Professional, NGO Organizations, Corporations, Local Businesses, Institutions/ Climate Research Labs, Governmental and other entities and individuals. In Boulder alone, hundreds of possible stakeholders have already been identified and “relationship-mapped” from disaster recovery efforts instituted since the catastrophic flood of 2013. Initially, the framework for the ARC design competition is envisioned to be implemented in Colorado, with students and professors at the CU Graduate School of Architecture and Planning, and/or with the support of other regional Architectural Colleges. Outreach to MIT's Department of Architecture and other Colleges will be extended to broaden the competition and stakeholders involvement nationally. Once an initial “dry run” of an initial ARC inter-College design competition concept is completed, the goal will be to seek funding sufficient to launch an annual competition with a national and international representation of Architectural Colleges. NOTE: The International “Solar Decathlon” (now sponsored by the DOE with $2 million in prizes), exemplifies the creation and growth of such a college team design contest*. Begun in 2002, the Decathlon now hosts entries from around the world, with the final judging location moved to a new city with each event. The ultimate goal of holding the College ARC design completion is to rapidly spread discussion about the benefits of Resilience Centers and trigger their physical construction across the nation and beyond. Each team’s design entry will add to the public “Vision” and awareness of what such Centers could look like to serve local climate resilience issues. Each team will help market the ARC concept their home towns around the world. Once multiple “Visions” for facility designs, economic feasibility studies, and program materials are developed in the competition, they can be shared collectively through “open sourcing" with any city or group interested in the concepts, located anywhere in the world. "Net Zero Marginal Costs" will lead to economies of scale for developing VR and other visualization technologies and visual program materials. Elements and mobile exhibits of ARC designs can be scaled relative to the resources, culture, need and issues of various locations, from small towns to megacities. A prototype Climate ARC facility could be built anywhere. Boulder, Colorado, could be a natural first location due to its dozens of Federal Climate National Laboratories and thousands of climate professionals. The intention is for the ClimateARC concept to be replicated and become ubiquitous across the country and the planet. In reality, any city, - including yours, could serve to host the first actual ARC facility location. Arcs can serve to transform social awareness in profound new ways, Saving $$Billions in damages, & thousands of lives. ClimateARCs will create a catalytic new paradigm for public engagement and social awareness that can nurture broad behavioral change. Increased community connectivity: Each ARC will offer a dedicated physical “place” to connect, specifically designed to enhance the experience and collaboration of stakeholders. ARCs will offer a highly visible “PlaceMaking” presence and identity in their communities. Increased awareness of local stakeholder capacities and roles: - ARCs will provide “information kiosks” with physical and digital materials to create a permanent and updated “SHOWCASE” for a multitude of stakeholder's initiatives, projects and events. Greater Public Engagement: “Fun” and engaging activities and events to draw the public and tourists to the center. Feasible: With the rising costs of Climate Disasters reaching into the hundreds of billions annually, more drastic and systemic, design-thinking needs to take place. The initial costs of holding the Architectural College competition will be negligible, and easily covered by "Affiliate Sponsorships". A business plan for funding the construction and operation of the first facilities will be mapped out before their construction. Funding can can from a broad range of public/private sources. From a systemic point of view, facilities "costs" will be only a fraction of the potential dollars saved through more effective climate planning and disaster cost avoidance. High Impact: Can provide a "PLACE" to inclusively support the implementation of many local and national initiatives. Imagine that ALL other MIT CoLab proposals could now have a physical base of operations at local Climate ARCs, and more effectively share their successes through the ARCs network with other affiliate groups. Demographically diverse: ARCs are meant to be designed to reflect local issues, traditions, and cultures. They are intended to embrace a full spectrum of stakeholders and regional jurisdictions. Sustainable: Both the facility itself, and its management and operations will be vetted for feasibility as a sustainable enterprise before any development commences. ARCs are anticipated to be financially self-sustaining, with the support of local stakeholders and businesses that would benefit. Applicable to Other Communities/ Ability to Scale Nationally: Once feasibility studies, and program materials are completed, they can be shared transparently and "Open Sourced" with regions throughout the US. "Net Zero Marginal Costs" will lead to economies of scale for rolling our ARCs nationally and even globally. Short Term: Develop a core team: co-working office and meeting space acquisition, Facebook, Twitter, website development, marketing materials, internet, land lines, signage, and misc. overhead costs. (90% volunteer staffing, and using personally owned computers). $3,500-$4,500. Medium Term: Laying out the framework for the “College Competition” for Prototype design development (with cash awards to the winners). Forming a “B”/non-profit, expanding a national stakeholder base, sponsorship outreach. Ongoing office, internet, accounting and legal. Internal fundraising and sponsorships, affiliations. Print materials for design development and marketing. (Marginal compensation for staffing and student internships). $5,500-$7,500. NOTE: The “Costs” of the program should be thought of in terms of being an investment with a huge ROI. In a context of the economic “Benefits”, the establishment of a national and global network of ARC facilities could save billions of dollars. In Colorado alone, the 2013 flood event “cost” the state of Colorado in excess of $3 billion dollars, as well as untold personal, emotional, and “ripple effect” costs. Tens to hundreds of millions could have been prevented if pro-active mitigation policies were in place BEFORE the disaster. Thousands of local organizations and businesses will reap the benefits of promotion of their sustainability initiatives and efforts. economy. Natural disasters are the “New Normal”. The ARC’s mission is to pro-actively institute climate change mitigation and resilience strategies that could save thousands of lives and billions of dollars. Relative to the anticipated Multi-Trillion Dollar Impacts of Climate Change, the "Cost" of this program will reflect a profoundly worthy "Investment"
Short Term, 3-5 months: Coalesce a formative group of University stakeholders and architects to layout the goals and intentions of the competition. Adopt the ClimateARC moniker for the Resilience Center concept, or rename it to “Brand” the competition. Network with stakeholders, other Universities, Entities, and co-sponsors outside of the formative group. Create a clear Mission, Vision statement and Goals and Policies for the group and its long term engagement with the Design Competition. Institute an outreach campaign to engage national stakeholders beyond Boulder. File for incorporation of the non-profit group, and build a critical mass sufficient to garner multiple competition entries from Colleges across the US. Medium Term, 6 to 9 mos. : Expand the reach and network of supporting and affiliate organizations. Finalize non-profit status, raise funding for future goals and actions. Engage other University and Colleges fields of study (i.e. Business, Behavioral Sciences, Computer Sciences, etc.) to participate with financial, economic, behavioral, and other overall feasibility plans for the project. Finalize completion details and awards for winners, and refine the project concept and program materials. Long Term, 9-16 mos. : Hold and judge the actual Resilience Center Design Completion. Judges shall include a broad spectrum of national Architects and Planners, but also Climate Scientists, Behavioral Science and Technology professionals, Civic and NGO leaders. Beyond: (Beyond the current project scope). Subject to feasibility, pursue support and financing, and schedule timeframes for physical construction of the first prototype(s) for a Climate Adaptation and Resilience Center(s)/ ClimateARCs. Continue ongoing development of digital technologies and VR/ Holographic program and other materials to be shared nationally. Investigate the possibility of further region-specific ClimateARC’s being constructed or installed in existing civic institutions nationally. Authors: Michael Schnatzmeyer, lead proposal author, co-funder: C-Smart Solutions, StartUp Longmont, Sustainable Resilient Longmont, et.al. Co-authors/co-sponsors of note: Korkut Onaran, CNU/CO Chapter President, CU Professor; De-Zheng Sun, Climate Scientist, MIT PHD Alumnus, Research Fellow at CU’s SEEC complex; Theo Horesh, Climate Author. Key to this proposal will be developing strategic partnerships, and engaging with entities and groups for “Showcasing” local organizations, initiatives and events. OF NOTE: The concept was embraced by the Governor’s Office, State of CO., and was included their application to the $1Billlion HUD/ NDRC competition. While not funded by HUD, this prior work has fostered relationships and networks that can continue to be built upon. Educational: CU, DU, MIT and various architectural schools. Of Note: Former CU Dean of the College of Architecture and Planning: Tom Clark, Professors Korkut Onaran, Joseph Yuhasz, Kat Vlahos and others. Local Climate Consultancy Businesses: Rocky Mountain Institute, et al. Of Note: Peter D. Krahenbuhl, Head of Partnerships & Consulting, Natural Capitalism Solutions (Hunter Lovins). General Technology, Local Businesses and Corporations: Google, Digital Globe, et al. Of Note: John Tayer, Pres., the Boulder Chamber of Commerce can play a key role in connecting with many local tech businesses. 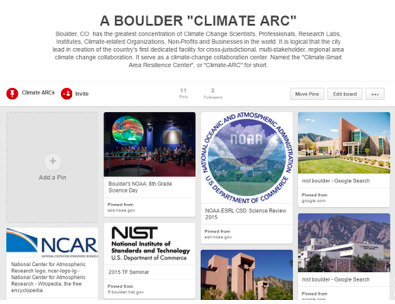 Climate-Change Area Resilience Center (ClimateARC), and National Network of ARCs, - a proposal for a "prototype" facility to be constructed in Boulder, CO.